We had another CF Clinic visit today at CHOA. It was a positive visit with good updates on weight , growth and overall health. Sutton is back up to 7lbs 5oz, almost birth weight. We will get another weight update on Friday at the Ped office. We started enzymes, salt and vitamins today. 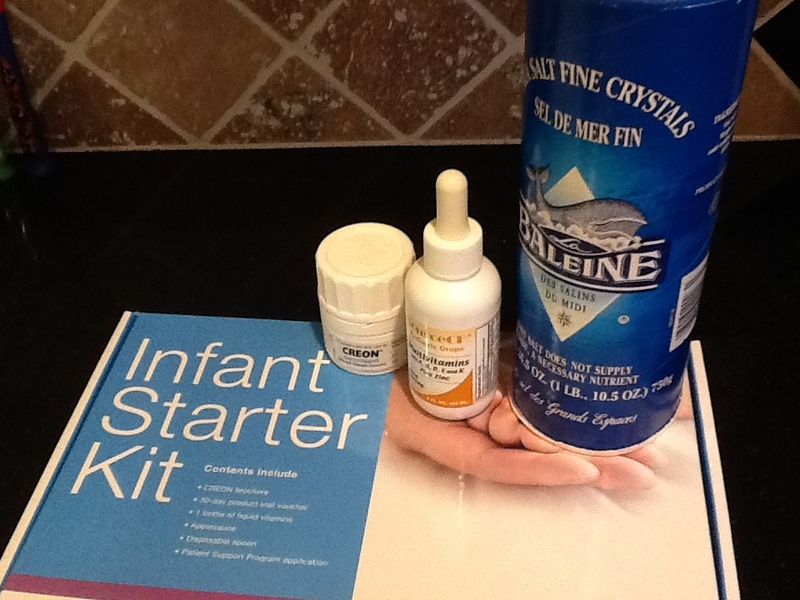 Its a challenge figuring out to get a newborn to take a pill, but the drug manufacturer has it all figured out and they even gave us a starter kit. We have to break open the pill, place it on a spoon with a very small amount of applesauce and then somehow get sutton to swallow it. Seems simple, but newborns have the reflex to push stuff out of their mouth with their tongue so it takes a few minutes to accomplish. Se is doing great at it and each time gets easier. Salt is as simple as adding it to her bottle throughout the day. Se takes 1/8 tsp all day, so not too much. Last is the vitamins. Much like over the counter polyvisol but much higher levels of fat soluble vitamins since she has a hard time absorbing them. We hope all of the new additions will help her weight take off and increase much faster. Sutton also is being welcomed to her first medical study for CF. The study is used to monitor nutritional intake vs growth in infants with CF. We have a few extra notes to take before her CF clinic visits and they will monitor her growth closely, but thats about it for the study. We are happy to support the study to help with CF research and maybe even help future CF patients.